Please click here to fill out the form (it will open in a new window). Having Briley do your work is simple. 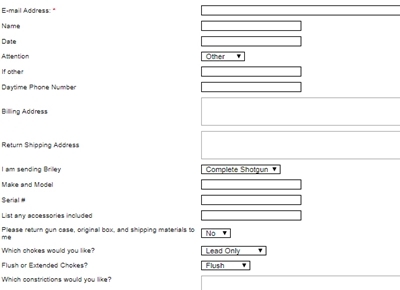 Please fill out the form then hit print, include a copy of the form with you firearm, and send us your firearm in a secure and safely packed box. If you have any questions please let us know at [email protected] .